Timer countdown display so you know exactly how long until your toast is ready. *Our electrical appliances are fitted with Australian electrical plugs designed to be operated on 220-240V, 50Hz power supply. You may use this product overseas by using an adaptor and may need a step down transformer. . This gorgeous copper-effect 4 slice toaster will add a touch of nostalgia to your kitchen. 220-240V ~ 50Hz 1800-2160W. Condition is New. The Morphy Richards Equip has seven browning levels. Besides the Cancel button the toaster features a Reheat function and a Defrost function. Handy for defrosting bread quickly or reheating it before serving. Model Number: 18790. 1 x Futura 4-slice toaster. Frozen bread function. Maximum thickness of bread: 26mm. Brushed and polished stainless steel. Colour: Stainless Steel. Material: Stainless Steel. Number of Slices: 4. Few little scuffs in Stainless Steel see Pictures. Independent 2 and 4 slice OperationThis stunning Toaster provides you with the option of using just one side of the toaster if toasting 2 slices as opposed to 4, which is a great energy saving feature and saving you money in the process.1 x Buckingham 4 Slice Toaster. With its striking black gloss finish, the De'Longhi Micalite CTOM4003 4-Slice Toaster will add a touch of sophistication to your kitchen as well as providing you with perfectly toasted bread. To help prevent your kitchen surfaces from becoming littered with breadcrumbs, the De'Longhi CTOM4003 Toaster also accommodates an extra deep crumb tray. For sale a dualit 4 slice toaster model 40370. for my own piece if mind i have just done 4 slices of toast in it to make sure its 100% ok. It is also easy to operate by having frozen, cancel and reheat settings. The auto high lift function which allows you to easily remove your toast when ready. For a fully coordinated look, pair with the matching pyramid kettle. The Breville Long Slot Die-Cast Smart Toaster. Sleek, modern die-cast steel construction and elegant 1-touch automation put this Smart Toaster at the top of its class. 'Lift and Look' functionality raises the motorized carriage and if you think it needs 'A Bit More' that’s an option too. Each Breville toaster also has both defrost and reheat settings plus a cancel button. It’s the perfect blend of performance and panache. Clever high-lift levers make it easy to both take a sneak peek mid cycle and toast bread tall and small without burning your fingers. Morphy Richards 241002 Equip 4 Slice Toaster - Red. 1 x Morphy Richards Equip 4 Slice Toaster - Red. The Equip stainless steel 4 slice toaster has a stylish, modern look designed to suit any kitchen. Variable browning lets you adjust the level of brownness for perfect crumpets, toast or bagels. A Frozen setting lets you toast bread straight from frozen, while the Reheat setting lets you gently reheat toast that has gone cold. Haden Cotswold Sage Toaster. The Cotswold range is available as a kettle and a four slice toaster in a charming sage colour. Delightfully elegant the Cotswold range will add a dash of colour to your kitchen. Variable browning controlVariable width slots - for thick breadDefrost / Reheat and Cancel buttonsTwin removable crumb trayLook and Lift feature - view progress of toast without cancellingHigh liftIlluminated buttonsNon-slip feetCord storageHigh quality pearlescent painted finish. 1 x Igenix 4 Slice Toaster. Variable width and self centring deep slots for a variety of bread types and sizes with anti-jam, auto shut-off and hi-lift facility. Andis Lithium Titanium Foil Cordless Shaver. Wicklow - Morphy Richards Accents 4 Slice Toaster - Cream. It is also easy to operate by having frozen, cancel and reheat settings. For a fully coordinbated look, pair with the matching pyramid kettle. Wicklow - Morphy Richards Accents 4 Slice Toaster - Black. Removable crumb trays allows you to easily clean your toaster. Reheat setting allows you to quickly reheat your toast. What's included. Warranty Included. Morphy Richards COMPLEMENTS 4 Slice Toaster CREAM 44012. Dispatched with Royal Mail 2nd Class. During use, the defrost, reheat and cancel functions are illuminated, making for quick and easy use. We reserve the right to refuse service to anyone. 28.5 x 21 x 29.5 cm. 900 Watt Power. This smart looking Dualit 40352 Vario 4-Slice Toaster in stainless steel is hand-made in the UK, with the emphasis being placed on high quality manufacture and service. DUALIT 40352 Vario 4 Slice Toaster Polished Stainless Steel Adjustable width slots. 4 SLOT, BLACK TOASTER, WITH. EXTRA HIGH LIFT. POLISHED STEEL TOP. BOX, MAY NOT BE PERFECT. CANCEL FUNCTION. REHEAT, DEFROST. The Delonghi Scultura kettle is a stunning piece of design and engineering that would complete any kitchen. 1 x Delonghi Scultura toaster. 2 removable crumb trays. 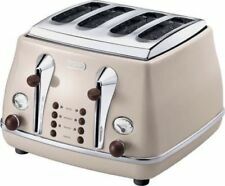 Stylish traditional 4 slot toaster. With a stylish design, this Premium Toaster has space for 4 slices of bread. 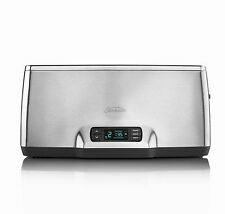 Functions include defrost, reheat and automatic bread centering. A 4-slice Premium Toaster. Automatic bread centring. Cord storage. Red indicator lights. If there's a problem, just let us know and we will fix it. 110 - 120 Volts. Long-slot 4-slice stainless steel elegance that gives you just A Bit More to attain ideal browning. And if you need A Bit More simply press a button. 5 Settings including; "A Bit More", Fruit Bread, Crumpet and Frozen. Frozen bread function. Maximum thickness of bread: 26mm. Andis Lithium Titanium Foil Cordless Shaver. Brushed and polished stainless steel. Exclusion apply. BuyBest UK. Key information. Health & beauty.